Fingerpicking the guitar is a must know for any guitarist, and is a technique the beginner guitar student should familiarize himself/herself with right at the beginning of learning how to play the guitar. Amazing melodies can be achieved by finger picking the guitar, you just have to get your fingers used to plucking individual strings. It gets easier with time, read on to find out how to practice fingerpicking. 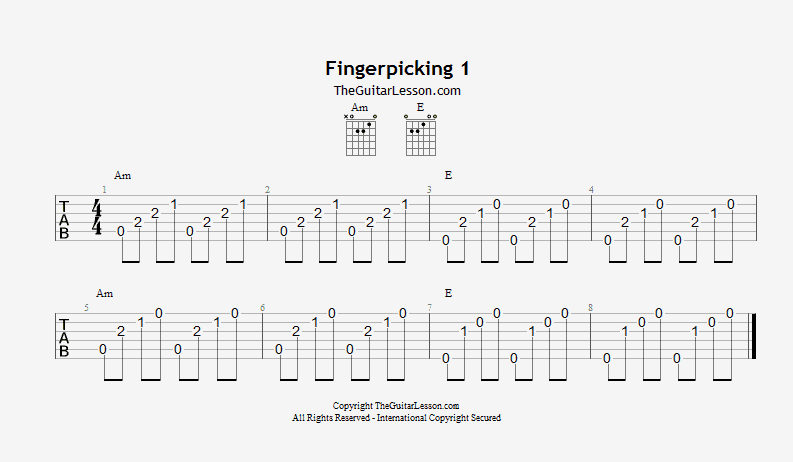 TIP: Watch our video guitar lesson on how to fingerpick the guitar. It'll teach you the basics of fingerstyle in a very clear and understandable way. The best way to go about learning how to fingerpick on the guitar is to arpeggiate chords that we are already familiar with, since the focus of practicing fingerpicking will be on the picking hand, not the fretting hand. For this example, lets hold down a C major chord. Your picking hand is positioned right between your pickups (for electric guitars), or over the sound hole (for acoustic guitars). Your wrist is slightly angled downwards, so your hand is perpendicular to the strings. Your thumb will be straight, while your other fingers will be curled in a semi knuckle. To carry out the arpeggio, you will place your fingers onto the strings, starting with your thumb onto string A, and your index, middle and ring fingers onto string G through E respectively, just slightly touching each string with your fingertip. Your pinky will not have a role at this stage, just rest it on your pickup or leave it in the air. Now it is time to arpegiate the chord. You will pluck each string of the chord with a different finger, starting with your thumb, and moving down to your other fingers. One finger will only pluck one string. Once your reach the high E string, pluck string B than string G again with the fingers responsible for those strings, and start the arpeggio over. Keep in mind that each finger is responsible for only one string, which means that they should not be touching any other string during the exercise. At first your fingers will not be well coordinated, and touch other strings by accident, but don’t worry, it gets better with time. There is no rush, just repeat the arpeggio slowly, until your fingers get used to the movement. Remember to keep your plucks precise, and try speeding up once your fingers are moving in a coordinated, precise manner. Once you feel you are comfortable with this movement, try fretting a different chord and arpeggiating it. You can arpeggiate any chord, just remember to fingerpick the bass note of each chord at this stage. Taking it to the next level will require months of playing, but you'll get there with enough practice. All guitarists went through this, so don't stress, just practice diligently. 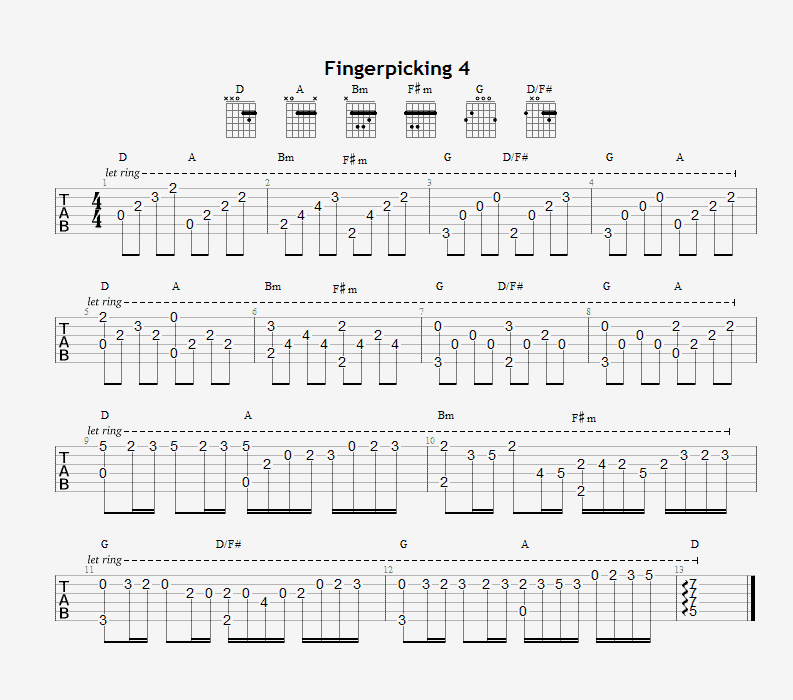 Once you feel like you're up to trying new fingerpicking techniques, have a look at the tabs below. You won't be simply arpeggiation chords anymore, you'll also be adding melody with these fingerpicking patterns. 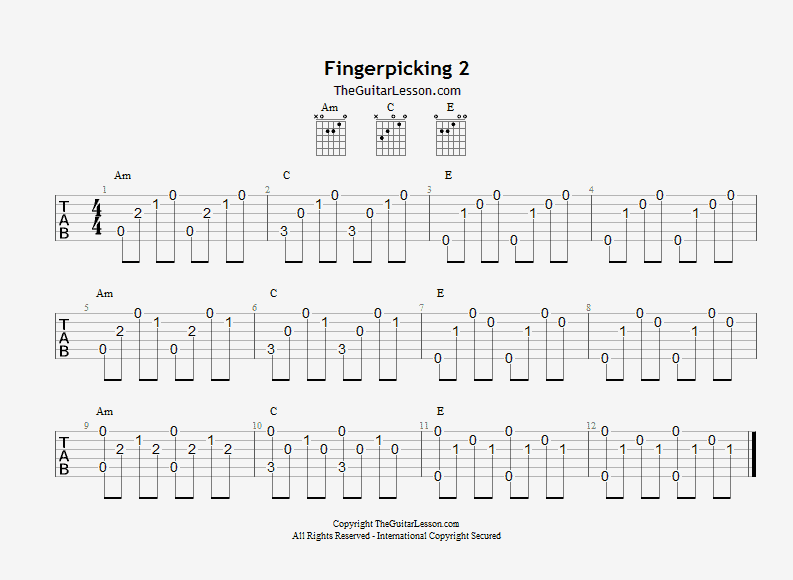 Once you can, feel free to make up your own fingerpicking patterns. First of all, create a chord progression, than apply a fingerpicking pattern to the individual chords. With the exception of your picking fingers, your hand should be as still as possible, not moving out of place. Your hand should be perpendicular with the strings, so it should be tilted down slightly. To achieve this, you need to keep your wrist totally loose. Your fingers will be assigned to the strings in their natural order, which means that your thumb will usually pluck the bass notes. Your index, middle and ring fingers will usually be picking the treble strings, so strings G, B and E respectively. Unless you get very proficient, your pinky will just be along for the ride staying out of the way of the other fingers, or just providing an anchor, a point of balance on lets say your pickup or the high E string. Repeat, than repeat again. This is vital to learning fingerpicking. Keep in ming that this is a precise movement, that your fingers are not used to. Why would they be? Fingerpicking movements are not used in everyday life, so you really have to get your fingers used to it. Start out slowly. Do increase your speed, but only gradually at your own pace. Its much more important to learn these techniques correctly, since you'll find that speed will come naturally. The more you do it he more comfortable you will get with it. It will take practice to become proficient at guitar fingerpicking. It may even get frustrating at times, but just remember that if you learn it correctly now, it will be of immense benefit later on. And of course, don’t forget that even the best guitarist started out somehow. Learning fingerpicking will improve your sound and groove immensely. Keep on practicing everyday, and soon you’ll see how making music will change your life. Playing music to yourself, your friends, your family is a truly rewarding experience.